Mayfield is a large village in Staffordshire situated on the outskirts of Ashbourne, Derbyshire, comprising the hamlets of Upper Mayfield, Middle Mayfield, Church Mayfield and Mayfield. The village predates the Doomsday book, where it gets a mention, when it is called Mavreveldt. King William the Conqueror owns Mayfield. Earl Aelfgar, Earl of Mercia and son of Lady Godiva, owned it until his death in 1062. There is one farm capable of supporting a household. There is sufficient land for twelve plough teams, each of eight oxen. The lord of the manor has one plough team of eight oxen. Nine superior sort of peasants and three inferior sort of peasants and a priest have three more plough teams between them. There are eight acres of land – probably the flat land along the river – suitable for grazing and hay. The first Norman church was probably built about 1125 during the reign of Henry I, and the present parish church, dedicated to St John the Baptist, illustrates the progressive styles of architecture since that date. The fabric and nave arcade are twelfth century, the chancel fourteenth and the tower sixteenth century. The stone cross in the churchyard is Saxon and once stood, together with the village stocks, on the boundary between Upper and Middle Mayfield. Mayfield can also rightly claim a small niche in history, for it was here, on 7 December 1745 that the army of Bonnie Prince Charlie passed on its retreat from Derby and terrorised the local population. Some of the Young Pretender’s troops shot the innkeeper at Hanging Bridge as well as a certain Mr. Humphrey Brown who refused to hand over his horse to them. Many of the villagers took refuge in the church, locking themselves in behind the west door. The Scottish soldiers contented themselves by firing shots through the door and their musket ball holes can still be seen in the woodwork. Musket ball holes in the church door made by soldiers of Bonnie Prince Charlie’s retreating army in 1745. In those days there was an old packhorse bridge over the River Dove and although the original structure was widened and eventually rebuilt in 1937, the 500-year-old grey stone arches of the original bridge can still be seen. Legend has it that many of the Scottish rebels were caught, tried for their misdeeds and hung from gibbets erected on the old bridge. It was a village, too, known to that great ballad writer, Thomas Moore. He lived at the cottage, formerly Stancliffe Farm, which now bears his name. Here he composed such well-known works as “Lalla Rookh” and “Those Evening Bells”, the latter being inspired by the sound of the pealing bells of Ashbourne Church just across the river. It was here, too, that he suffered tragedy with the death of his young daughter, Olivia. She is buried in the local churchyard, her slate tombstone reading “Olivia Byron Moore, died March 18, 1815″.It was Moore’s friendship with Lord Byron which led to the child bearing his name. Moore’s journal records the visit of Lord Byron and other notables to his country cottage, and his affection for it is reflected in the fact that he twice revisited Mayfield after moving to London. Mayfield Hall, once part of the Tutbury Priory estate. There is however a road out of the village, leading to the main Leek highway marked on the Ordnance Survey map as “Gallowstree Lane”, suggesting that those to be hung went their way via the bridge and Gallowstree Lane to Gallowstree Hill. Today it is a pleasant walk rewarded by a lovely view down the Dove Valley. The Mayfield Mill site has the fairly rare distinction of a history of almost 200 years of textile production. The first mention of any sort of mill occurs in a property valuation of 1291: most of Mayfield then belonged to the Priory of Tutbury and it included a corn mill. By 1793 there had been various owners of the site which has developed to include two corn mills, two fulling mills and a leather mill. Textiles first appeared in 1795 when the cotton mill was completed. Unfortunately in 1806 the interior of the building, together with most of the machinery, was destroyed in a fire. When the mill was eventually rebuilt it was with a cast iron framework and brick vaulted ceilings, as can still be seen in the oldest of the buildings, to prevent a repetition of the fire. The spinning of cotton continued in Mayfield with various degrees of economic success until 1934 when it was sold to William Tatton and Company who used the mill to process silk. Since then it has seen changes of ownership and production but the mill remains. 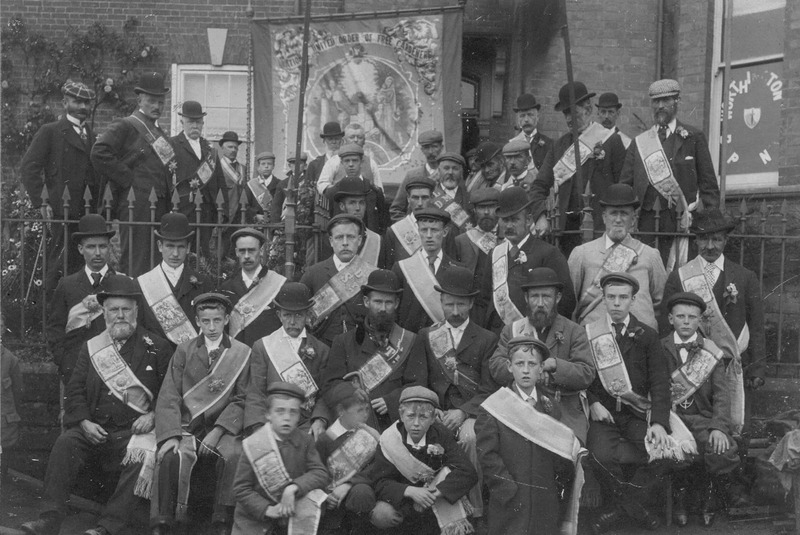 1894 After a thousand years, the Hundred of Totmonslow disappeared and Mayfield Rural District Council was created. 1896 The first well dressing in Mayfield took place and was repeated in 1897 but then banned by the vicar who disapproved of the rowdy behaviour of the intoxicated villagers. 1974 Mayfield Rural District Council was absorbed by East Staffordshire Borough Council. 1990 Mayfield Heritage Group was founded. 1995 Well Dressing was restarted after 98 years and has taken place annually ever since without rowdy behaviour by intoxicated villagers being noticed (so far) by the vicar.